They had made some improvements (at least IMO) to their chicken sandwich. Last time I was here this was described as a, “Grilled Herb Chicken Breast topped with Brie Cheese, Cucumber, and Frisee tossed with Raspberry Vinaigrette on a Multi-grain Bun.” Now the Grilled Chicken Breast sandwich was topped with Smoked Bacon and Cheddar Cheese. So less healthy, but it sounded really good to me. I probably would have tried this had we been able to get a table here for dinner the night before. Another change was made to their salad entree. In 2015 they had a Chef Salad (with all the usual ingredients) topped with a parmesan vinaigrette. Now their salad was called a BLT Salad and therefore had only bacon, lettuce, and tomato topped with ranch dressing. In this instance, I would say the change was a downgrade, but again that’s just my opinion…YMMV. Anyway, they also made a few changes to their sides. Previously these were limited to onion rings, french fries, tomato bisque and a bowl of chili. 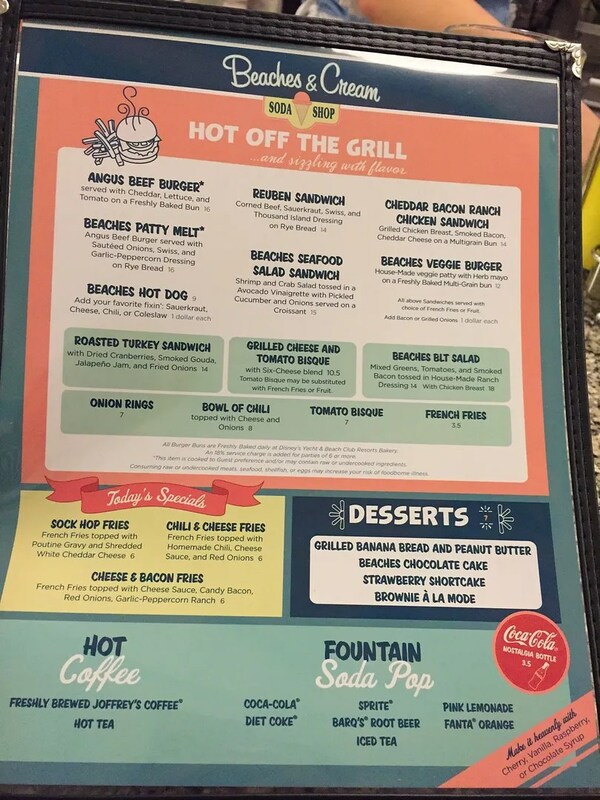 Now, in addition to these, they now offered three variations of “loaded” fries…the Sock Hop poutine fries, Chili & Cheese fries, and Cheese & Bacon fries. All of these sounded great to me. 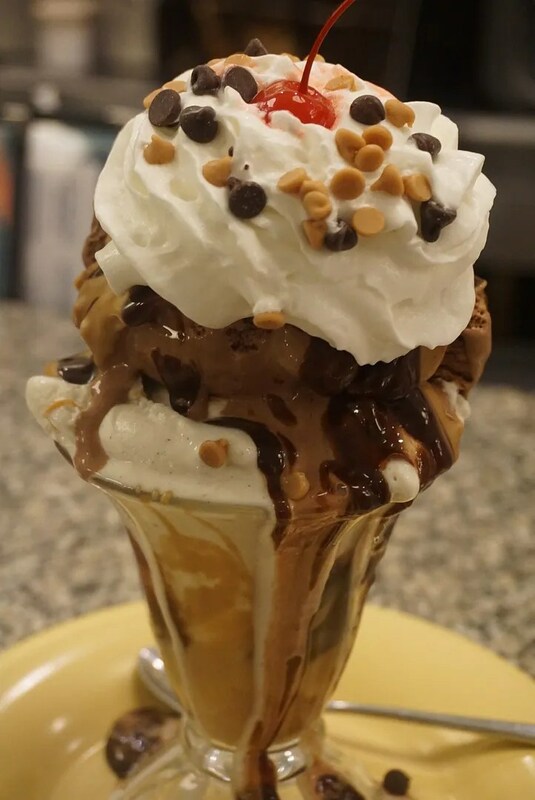 In case you don’t recognize this, it is a smaller two scoop version of the No Way Jose Sundae. 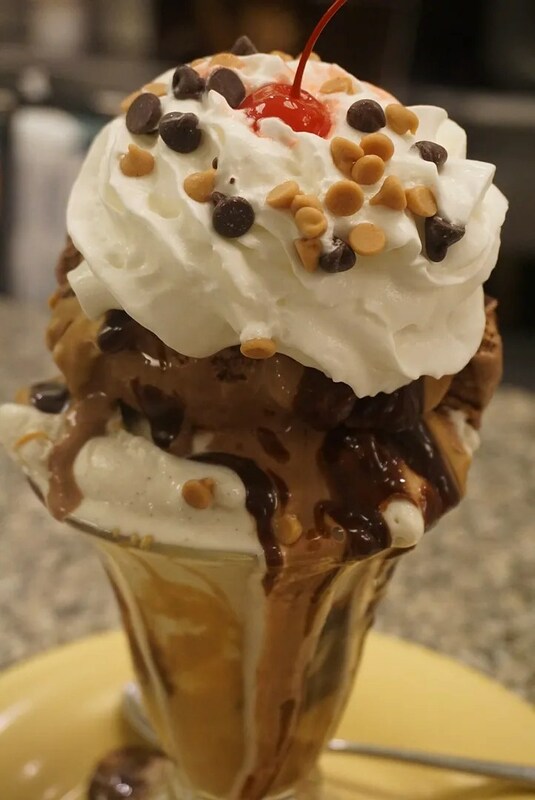 This had one scoop each of chocolate and vanilla ice cream topped with peanut butter and hot fudge, peanut butter and chocolate morsels, whipped cream and a cherry. And as always, this was heavenly! Also, in case you’re wondering, I was charged $6.00 for this, which is the price of two scoop Old Fashioned Sundae. 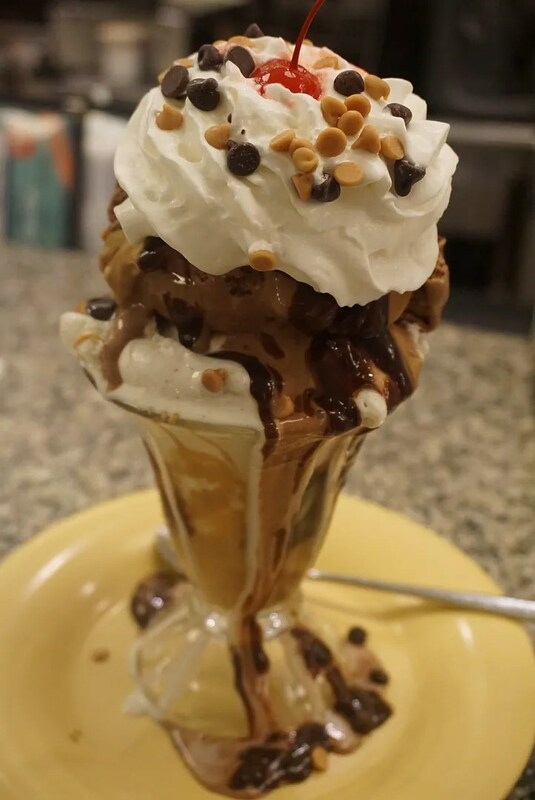 On previous trips I was charged a $1.00 for the extra topping (since this has both peanut butter and hot fudge) but this time my server kindly did not charge me extra. 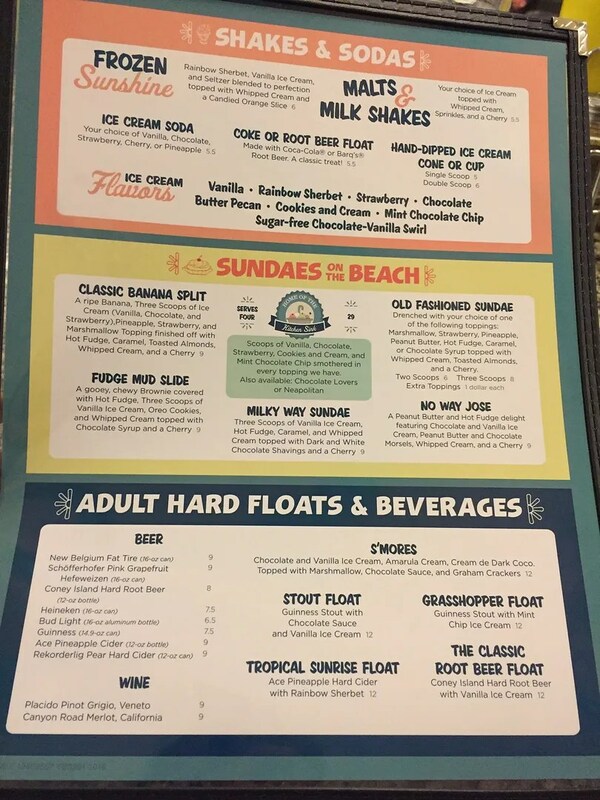 Based both on my love of their No Way Jose sundae as well as the other food I’ve had at Beaches & Cream on previous trips, I would rate it 4 1/2 stars. This is the same rating that was given by Trip Advisor reviewers but slightly higher than the 4 star rating from Yelp. 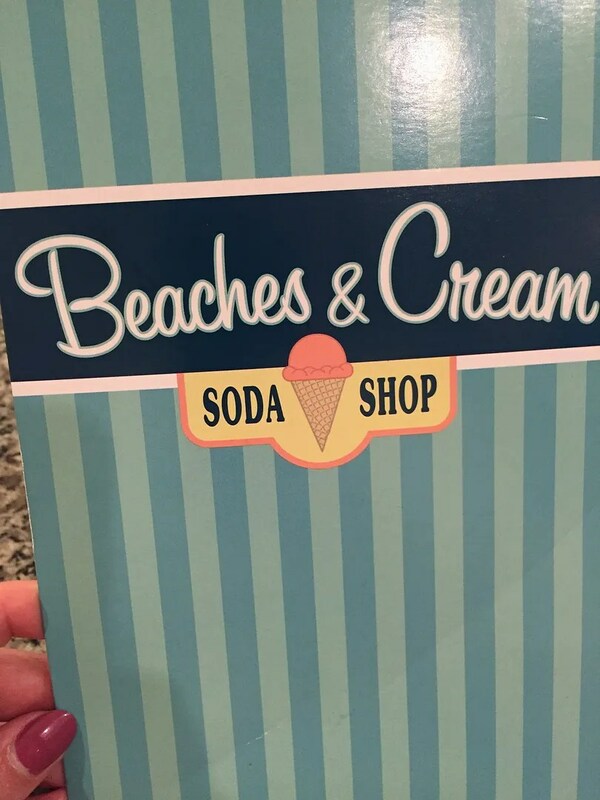 Also, Beaches & Cream ranks pretty high on Trip Advisor, ranking #85 of the more than 3,000 Orlando area restaurants reviewed there.